With the Walimex pro 650-1300/8-16 DSLR T2 you own a very special lens. 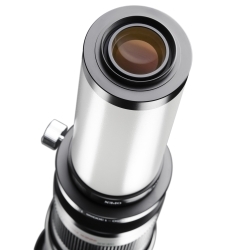 The construction of this full frame lens is that of a classic refractor. However, the zoom function is not controlled by turning a ring. Instead, you simply pull the lens to the right length and thus the desired focal length, just like with an extendable pocket telescope. A scale shows the selected focal length and the corresponding aperture. 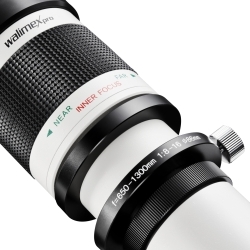 The Walimex pro 650-1300/8-16 DSLR T2 is a manual push/pull zoom lens. 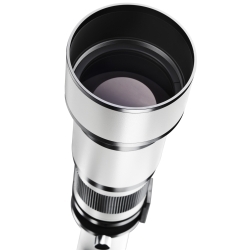 The lens has a T-mount connector and may therefore be attached to a wide variety of cameras using an appropriate adapter (sold separately). Of course, the Walimex pro 650-1300/8-16 DSLR T2 can also be operated with smaller sensors than full-frame. This results in the usual consequences, namely a corresponding crop factor and minimized vignetting. With the Walimex pro 2x converter (Art. 12602) you can double the focal length. 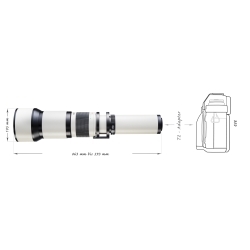 On an APS-C sensor, for example, you can achieve a focal length range from 1,950 to 3,900 mm! 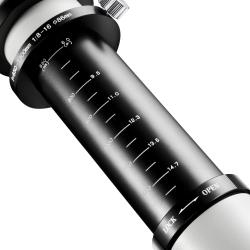 The glass lenses used, 8 lenses in 5 groups, are multi-coated to achieve optimum imaging performance. The typical effects of such a beam path, such as chromatic aberration, are minimized. This lens has no iris diaphragm though, exposure is controlled solely through ISO and the exposure time of the camera. The maximum aperture of f/8.0 allows a bright viewfinder image when used outdoors. The internal focus is controlled manually. This means that the outer shape of the lens does not change during focusing, which is a great advantage when the camera and its lens are carefully positioned on a tripod. 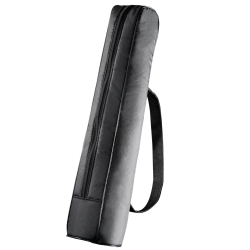 The constant maximum opening of the beam path allows you to work with maximum light output when focusing. 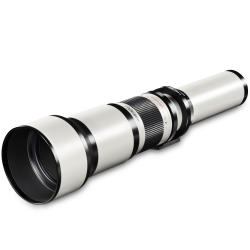 Even at a focal length of 1300 mm, the minimum focus distance is only 5 meters. The Walimex pro 650-1300/8-16 DSLR T2 is made almost completely of metal, and therefore extremely stable. Nevertheless it weighs only 2 kg. A 360° rotatable lens mount ring allows a quick change between landscape and portrait mode. Of course, the lens can also be locked in any other position. The camera and lens remain securely on the tripod even when the fixation is open. The lens hood is also very stable and screwed to the lens. It can be detached. The Walimex pro 650-1300/8-16 DSLR T2 delivers respectable performance for little money in its class. At long focal lengths the chromatic aberration increases, as is well known, but various common softwares will help reliably in the post-processing. Note that you also need a sturdy tripod to align your camera accurately and securely with this lens.